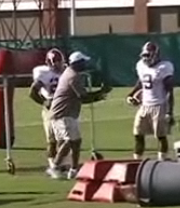 Watch the following video of Mark Ingram practicing today. He is looking good with a light brace on his knee. Coach Nick Saban says Ingram will work lightly in this week's practice, and would most likely be utilized in situational packages verses Duke. "Mark's situation is going to be a little bit evaluating how much he plays relative to how much he can practice. You're still going day-to-day with a guy coming off of an injury," Saban said concerning the status of Mark Ingram today (Monday). So, I am willing to bet that Alabama won't use Mark Ingram too much (if at all) in the Duke game. Trent Richardson can man the ship for another game, but it would not be a bad thing to let Mark hit some people before the first big match against an SEC opponent in Arkansas on Sept. 25.